Gladiators were divided into different classes according to their weapons and fighting styles. There were strict rules and protocol surrounding the fights of gladiators. The first Roman Gladiators were prisoners of war and used the weapons and equipment characteristic of their people. The early enemies of Rome included the Samnites, the Thracians and the Gauls (Gallus) and gladiators were named according to their ethnic roots. This changed over the years and the names of the different types of gladiators reflected their combat techniques such as Secutores (chasers), Bestiarii (beast fighters) and Retiarius (net fighters). There were therefore many different types of gladiator, including the Bestiarii, who specialised in using specific weapons, armor and shields. What type of gladiator was a Bestiarii? What weapons and armor did they use? - - Criminals, prisoners of war or Christian Martyrs were executed as common criminals by "damnatio ad bestia" (thrown to the wild beasts). The role of the gladiator referred to as the bestiarii grew in popularity. There were large numbers of gladiators who volunteered to take on this role due to the rewards and adulation they received. It was also a less dangerous role than that of the other gladiators who had to fight to the death nearly every time they entered the arena such as the one at the Roman Colosseum. The fights were arranged in such a way that there was a small chance the animals would defeat the Bestiarii. The Bestiarii were trained in specific schools who specialised in fighting wild and exotic beasts. The schools were called the scholae bestiarum or the bestiariorum. The Bestiaries School in Ancient Rome was called the Ludus matutinus, which was a building situated adjacent to the Roman Colosseum which was established by the Emperor Domitian. The name of the school, Ludus matutinus, is derived from Latin word matutinus meaning "of the morning" which was when the animal, or wild beasts fights, were scheduled. Both slaves and volunteers were trained to fight with wild beasts. 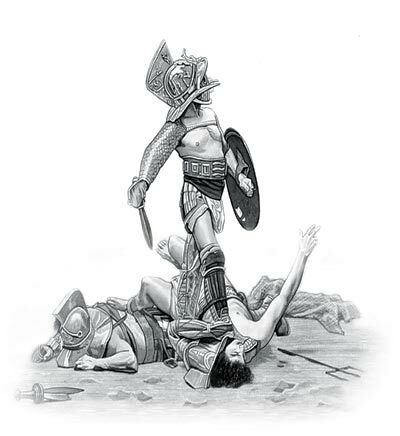 The content of this Bestiarii category on the different types of gladiator who fought to the death in the gladiatorial combats staged in Ancient Rome provides free educational details, facts and information for reference and research for schools, colleges and homework. Refer to the Colosseum Sitemap for a comprehensive search on interesting different categories containing the history, facts and information about Ancient Rome. Interesting facts and information on this type of gladiator: their weapons, their armor and their style of combat.